Mallorca 2012: now the feature film! 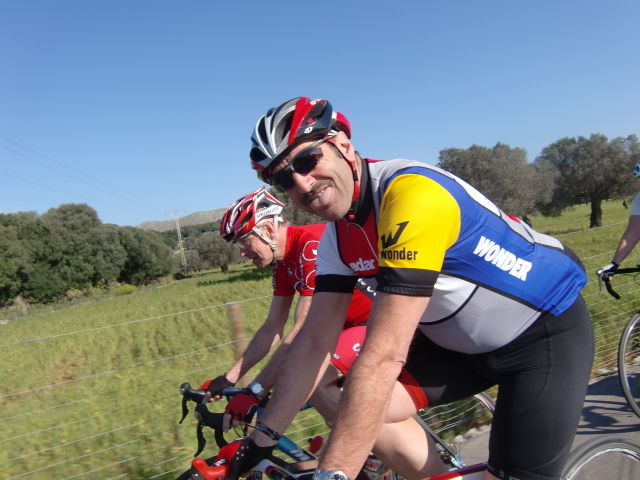 With thanks to John from Alpine Cadence, here are a few action shots of our riding in Mallorca. For once, an early morning sun greeted us, and arm & leg warmers were stored in back pockets for use on the long descents to come. The country lanes were awash with brightly-coloured pace-setters, and as the pelotons passed, you occasionally picked up a whiff of embrocation. Today was going to be a climbing day……two major summits that would demand about 7000 feet (2,200 metres) of toil against the force of gravity. Oh, what joy! 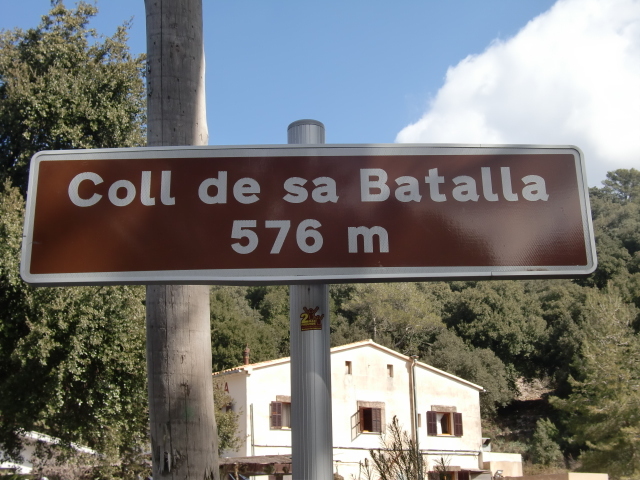 The first ascent was to be the Coll de Sa Batalla (so aptly named! 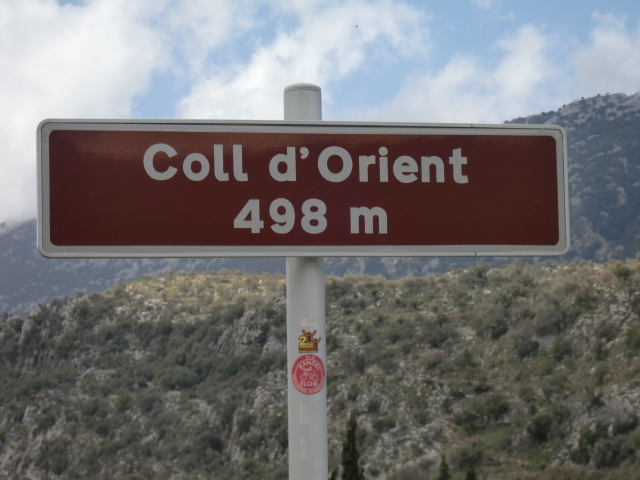 )…..nearly 8kms of a 5% gradient to a height of 576 metres. 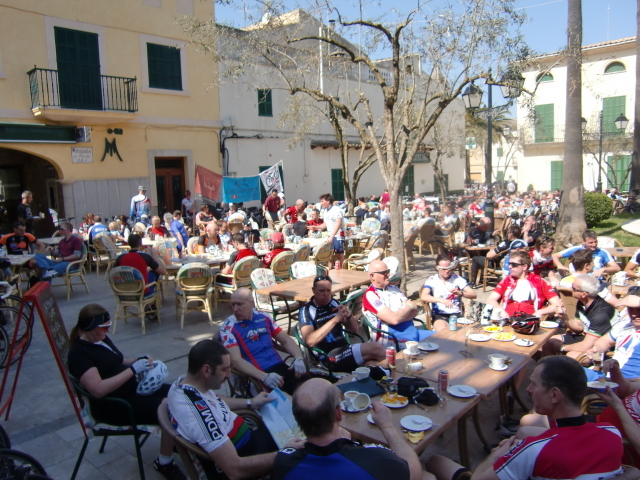 The great incentive was the excellent watering-hole at the top, shared by hundreds of other roadies, all out on a mission to conquer the last few major ascents before the end of the week. But the Sa Batalla paled into insignificance against what was ahead of us. 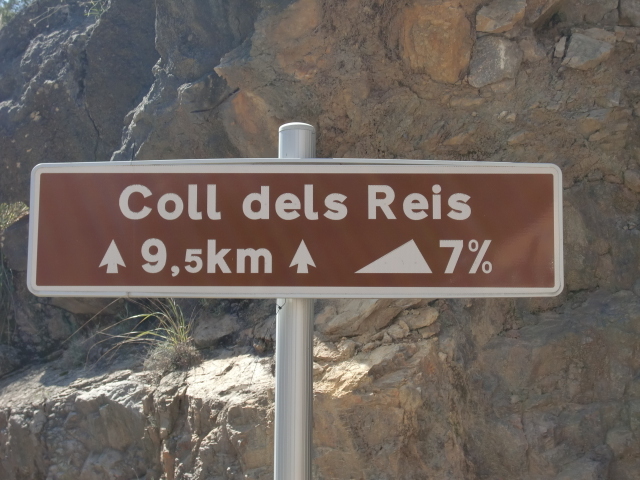 The infamous, and much-feared, Coll dels Reis ( Sa Calobra) , which descends for nearly 10kms, from a height of 682 metres, to a little remote bay from which there is only one way out……….. the very same 10kms (7% gradient) climb back up to the summit. The descent alone inspires terror in some, as it snakes its way ever downwards. 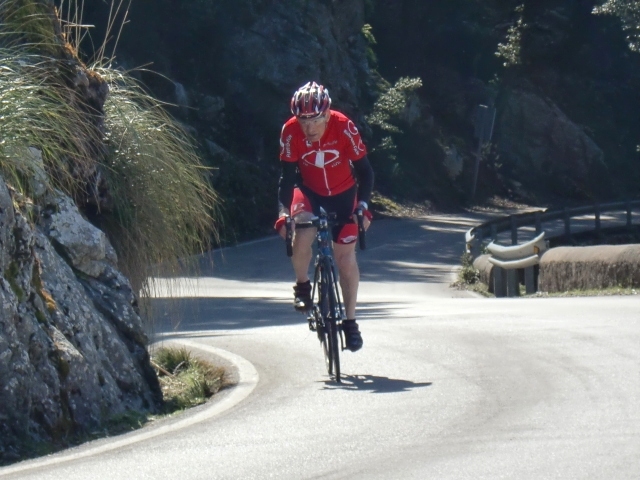 If you are nervous of steep, winding descents, it is best not to contemplate it from the top…..just get on with it! Save your nervous energy for the 50 minute arduous climb back to the top. Every such climb always has a pay-back. 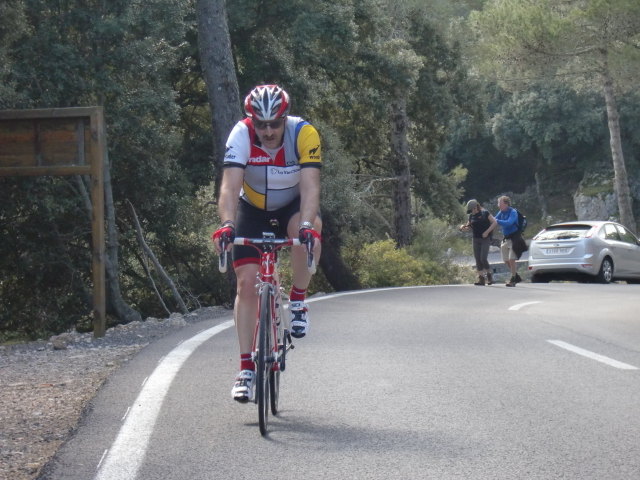 As we headed back to Pollenca, the descent was very long and very fast, with little need of brakes. An exhilarating finish to the final day of the tour. 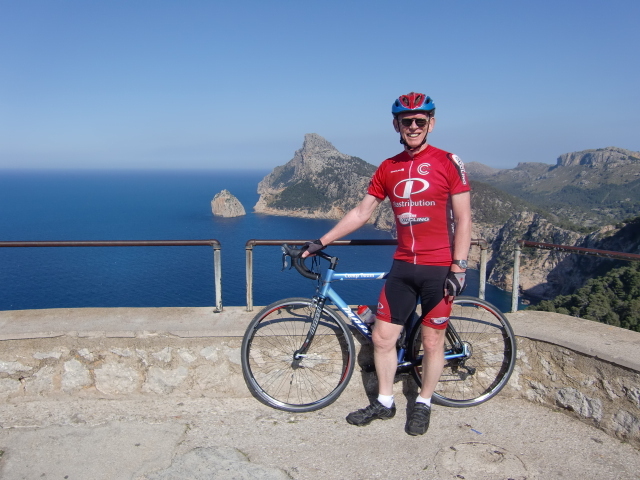 Recommendation If any of these reflections on Mallorca have caught your attention, and you fancy ‘dipping your toe in the water’, you need to contact Tony Cork. 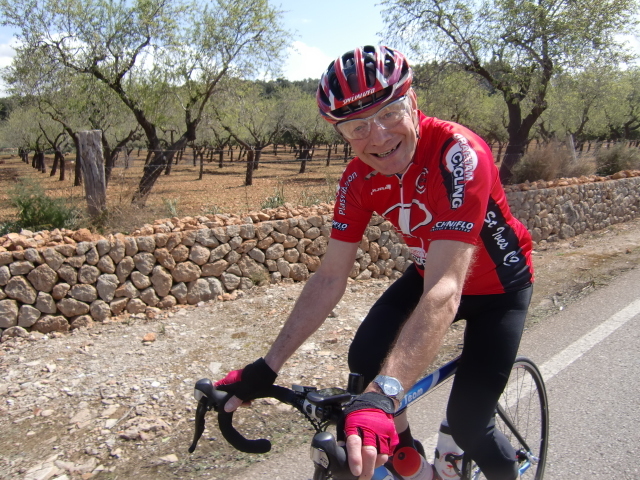 Click here for his website: http://www.majorcacyclingtours.com/. 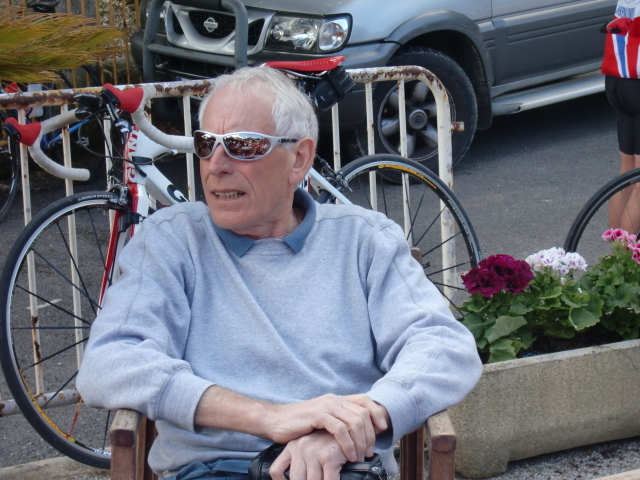 Tony has spent many decades in the world of cycling, both as a practitioner and organiser. His training camps and tours are organised with every attention to detail. They are superb. If he could arrange the weather, he would do that as well! 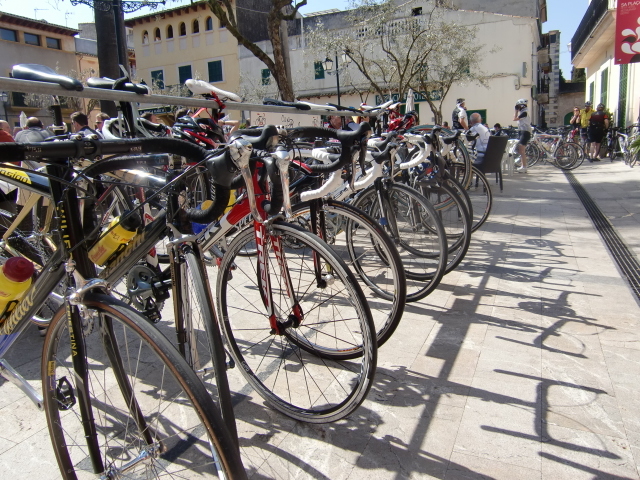 It is an understatement to say that Mallorca becomes the cycling capital of the world in the late winter/early spring. With the bad weather largely behind us, the roads were veritably clogged with pairs of legs pumping carbon-fibre (or alloy, as the case may be!). On the rainy day yesterday, few groups had been in evidence, but solo cyclists like myself had been everywhere. Now the groups and clubs are out in force, fighting for road space. Road vehicles must be out-numbered by cyclists, at least by 5-1, and you note a certain respect amongst drivers for the pervasive presence of the pedal-pushers. They even stop on roundbouts to let pelotons take priority. Without a doubt, cyclists are the mainstay of the local economy during these dormant months of the season, and many of the locals do their little bit to make them feel welcome. The threat of more rain dictated the route: stay on low ground and ´motor´ the miles. 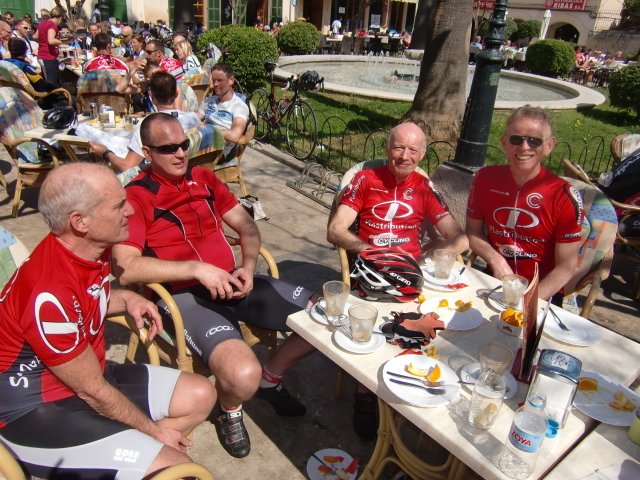 Direction south: across the albufera (the closest thing to fenland) following tiny country lanes to the ancient town of Sant Llorenc where (unbelievably) we found a cafe in the plaza where we were the only cyclists! And the hunks of home-made cake were enormous! 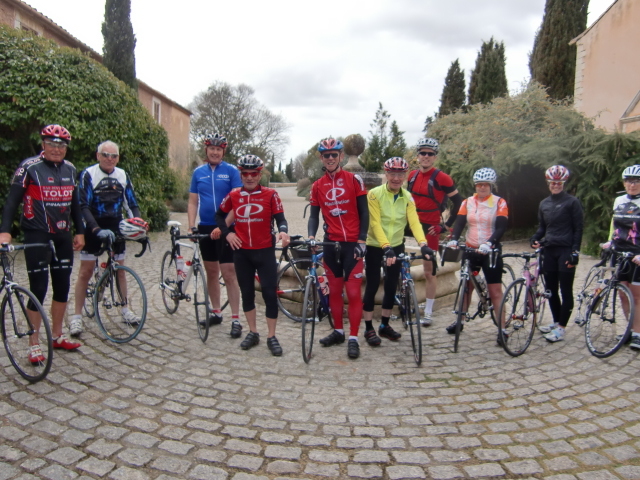 But they provided the power to the legs to take on a few challenging little climbs and justify a second stop in the village of Sineu, where most of us indulged in baguette sandwiches, big enough to ´pop´ your tyres under the added weight! 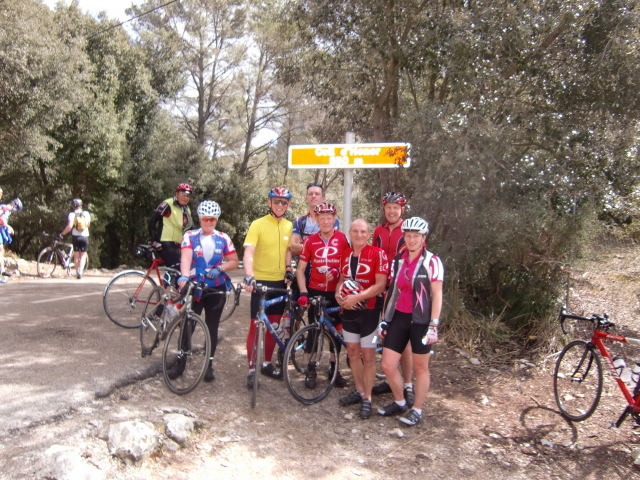 And….yes…we did have a puncture in the group……. Now, a question: how many people are required to mend a puncture?…….. Well, in this case, five volunteered their services……a question of too many cooks….? Not at all……it was mended in a trice. 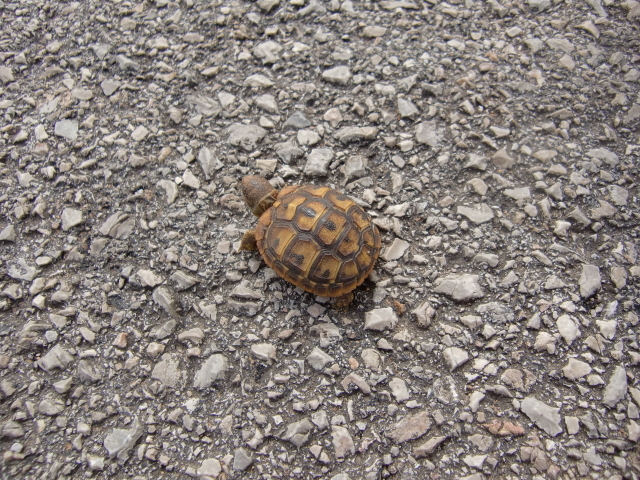 We managed not to squash this little tortoise! A welcome little touch in each cafe are the segments of orange doled out in their dozens to thirsty cyclists. And free of charge. Dishearteningly, the morning greeted us with overladen skies and another threat of rain. Everyone dressed for the part, hoping the worst would not be inflicted upon us. But our outward route was flat and winding, intertwining with dozens of other groups from the four corners of northern Europe (but mainly Germans) as we headed through Santa Maria to Bunyola. Our stop there, to fill the empty reserves after nearly 45 miles of cycling, was overshadowed a little with the knowledge of the enormous climb to come. 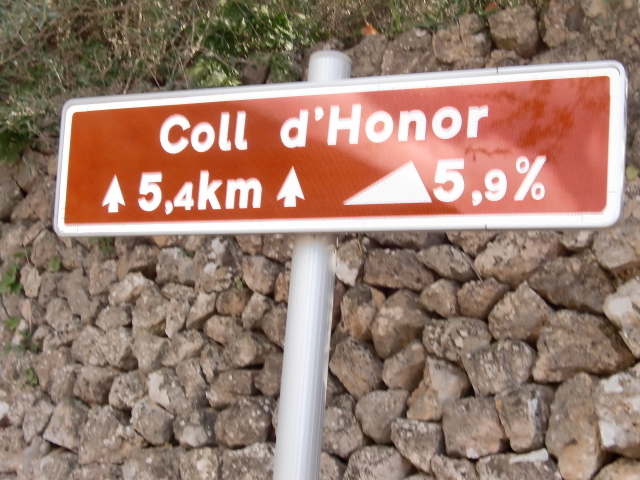 The Coll d´Honor was to take us to 550 metres at an average gradient of 5.9%, then after a dip downwards, on to climb the Orient at 490 metres. 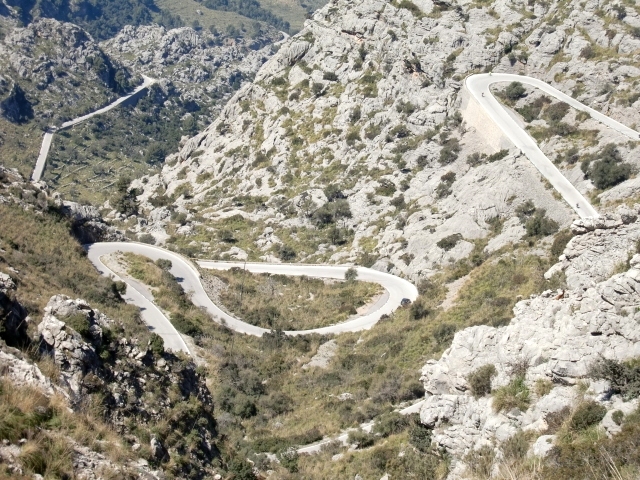 These climbs break up the cohesion of any group, but after re-grouping at the top, you enjoy the long, very fast descent, frequently touching over 40 mph (60 kph). It is hard to adequately describe the sense of exhiliration………. 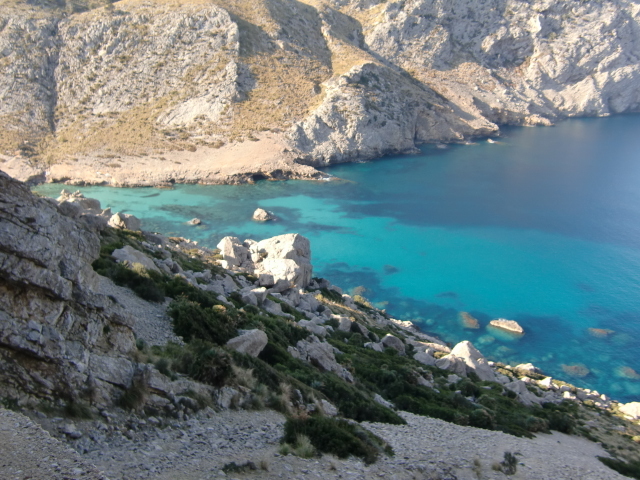 What should have seen a sortie to one of the most gruesome climbs, and descents, of the island (Sa Calobra), was postponed to a better day. 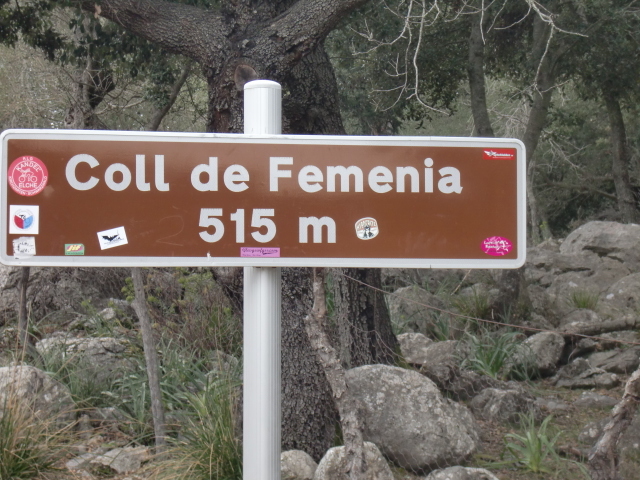 In its place we did the more gentle ascent of the Coll de Femenia (7.5kms to 515 metres, with an average gradient of 5.5%), but the descent was precipitous, with numerous switchbacks and scary moments. And despite donning extra layers, everyone was perished with the cold when they arrived in Selva for a well-deserved break. 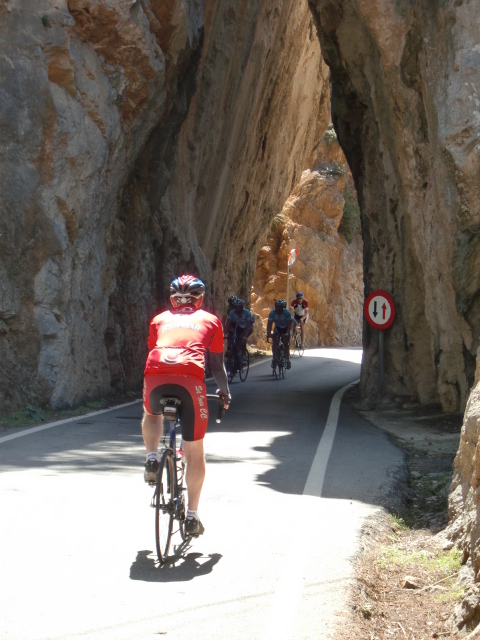 The route back was a relatively civilised cruise through narrow country lanes, many of which do not even feature on cycling maps of the island. The wayside vineyards lay dormant from their over-wintering, awaiting the warmth of a spring sun to stir them into life. There were two options today: 1) stay warm, comfortable and dry but feel miserable or 2) get cold, wet and uncomfortable but ultimately feel happy that you kicked that leg over the crossbar and headed out to the wilderness. Planned rides were cancelled (mainly for safety reasons), so everyone made their own arrangements. 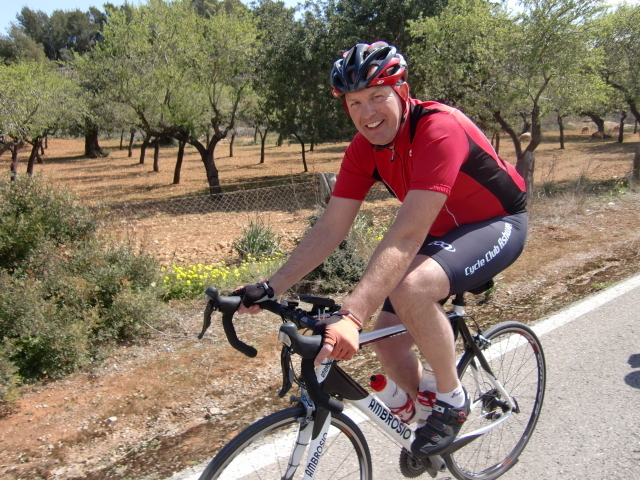 Wisely, or unwisely, I dug out the steed and headed off along the coast to Alcudia and beyond, and discovered a cross-wind that had me leaning at (what seemed like) a 45 degree angle. Unnerving to say the least. 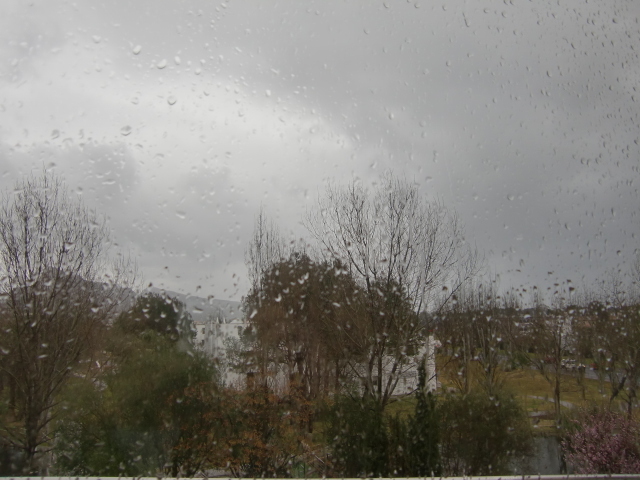 I pressed on towards Artá, then turned inland to Petra and Sineu, and discovered how localised the weather really was. From flooded roads to dry roads (within 5kms), from head winds to cross winds, from dark thundering skies to the hint of promised sunshine…………there was never a dull moment. 1. The completion of the Spanish Magna Carta in 1812 was celebrating its bicentenary in Cadiz, with the presence of the King and Queen and the President of Government. 2. March 19th, Feast of St Joseph. This is the highlight of the huge fiesta in Valencia (Las Fallas), when they burn nearly 800 satiric effigies (many as big as a house) around the city. The fire-brigades are kept very busy, and the consumption of alcohol breaks all records. 3. 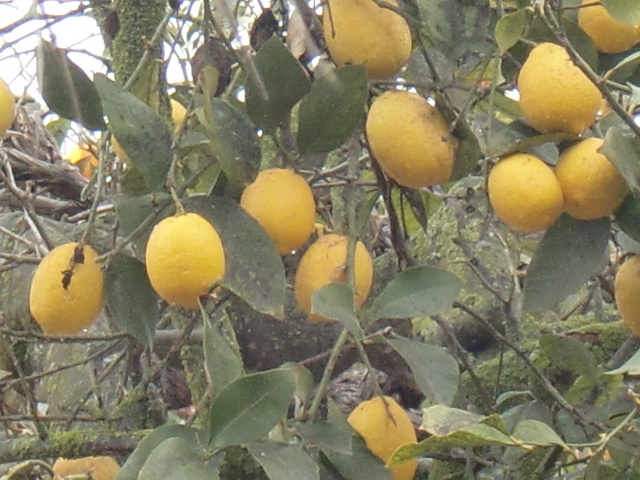 The local language on Mallorca is Mallorquín (a dialect of Catalan). 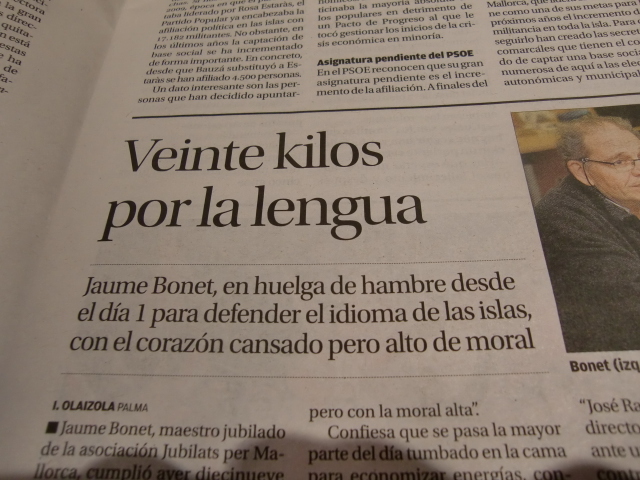 A recent local government bill has decided that fluency in Mallorquín will no longer be needed for jobs in government, the civil service or teaching. A local teacher is 2 weeks into a hunger strike in protest. He is willing to sacrifice his life to see the preservation of the local language. If he persists for another couple of weeks, expect to see reports of this in your country´s press. The scene is set for a mass start, but the threat to local traffic is diminished by the division of this 40 strong group into three groups according to ability/age/inclination or any other characteristic that is relevant to the kind of cycling experience you want. Everyone is furnished with energy drinks, energy and power bars and go-faster drink powders which are meant to enhance the day. 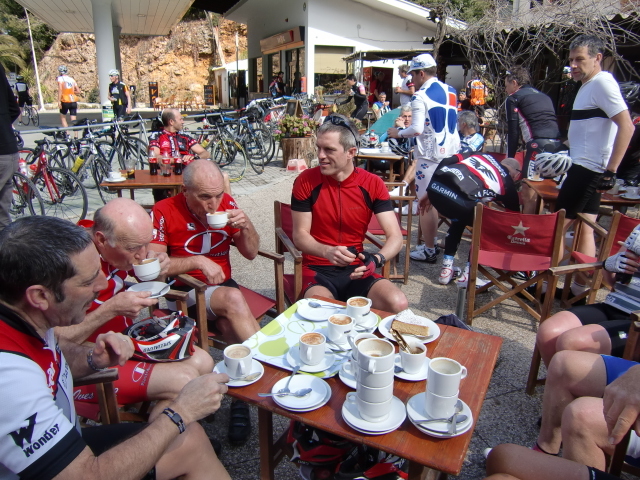 We head off, behind the group leader, cruising almost effortlessly (the terrain is flat, after all) to a coffee stop in a plaza in Petra where we join several hundred other cyclists (many German) who have chosen the same spot for light refreshment. It is almost like being a part of a massed cycling event. 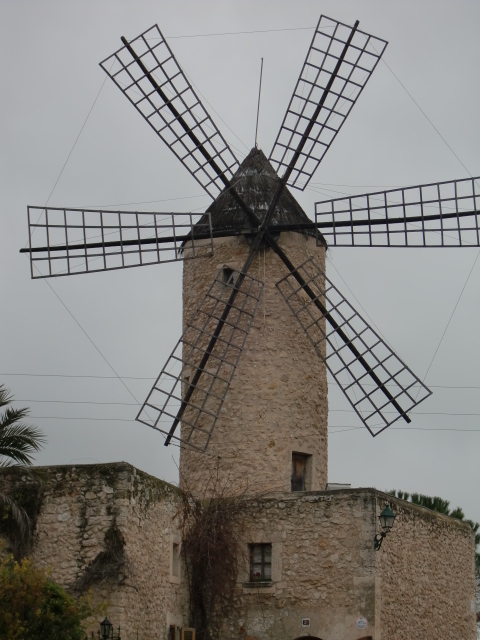 The route back takes us through little villages, across countryside dotted with spent windmills, bypassing citrus groves and blossoming almonds trees, to find some respite back at base-camp. 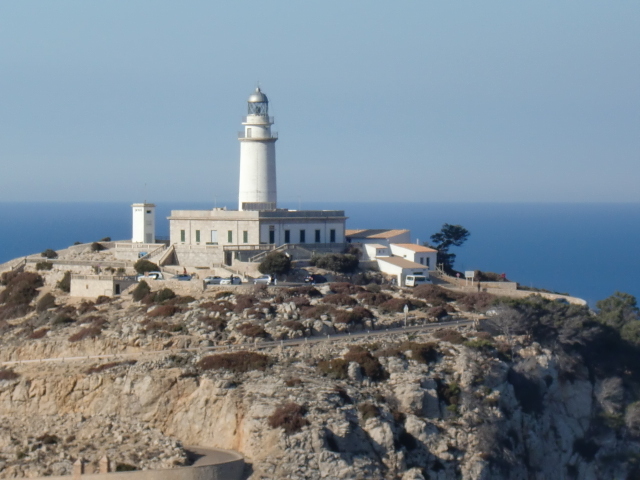 A few decide to add to their day´s mileage, and make a late day trek up the steep climbs to Cap de Formentera, where a remote lighthouse greets you if you make it all the way to the end of the peninsula. 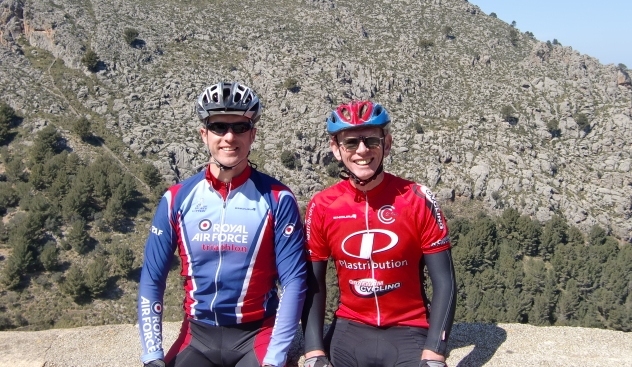 I was finally persuaded to join my cycling club’s annual winter training week in Mallorca. One of the membership runs training camps for cyclists throughout the winter, and St Ives CC (which is primarily a racing club) make a pilgrimage out there every March and immerse themselves in calculating wattage, pulse rate, optimal cadences, latest ‘tricknology’, carb intake measured against power output……..C’mon guys, lighten up a little………..this is all about riding a bike…….just enjoy it!! Apparently some 60,000 (yes, sixty thousand!) 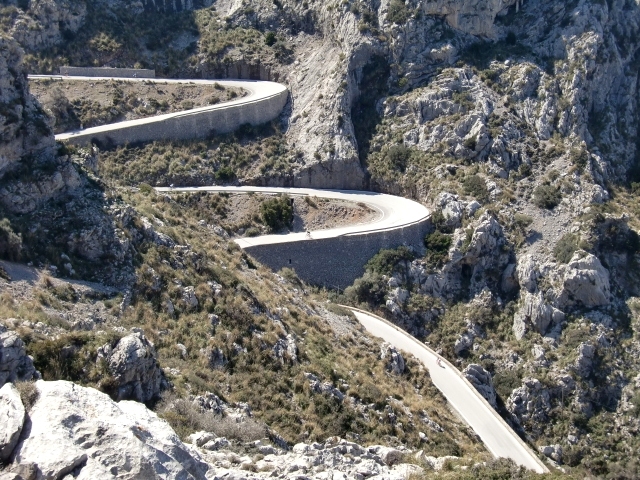 roadies head to Mallorca every winter from northern Europe to get in their base, or pre-season, training. The roads are filled with packs of multi-coloured, lycra-clad mile-eaters, legs turning at optimal speeds to give all the ‘right readings’ on their electronic monitors, so that they neither over nor under train. Instead of simply enjoying the ride or the wonderful surroundings on either side of the road, their eyes are locked onto the readings of their Garmins, pacing themselves according to a pre-planned schedule. I (along with a few others) am going simply ‘for the ride’. 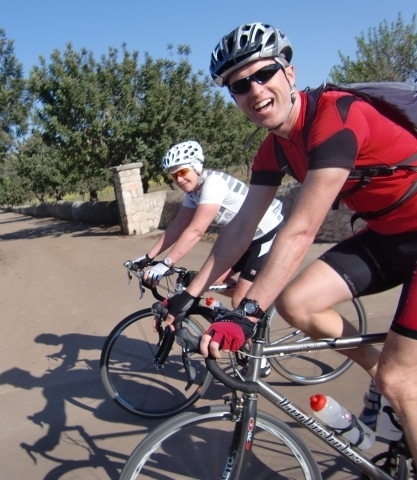 My cycling goals and objectives are to enjoy the hard riding in the mountains, be intoxicated by the long descents, and have fun…..then more fun……..and enjoy the post-ride carbo-loading (ie. eating and drinking ;0)). 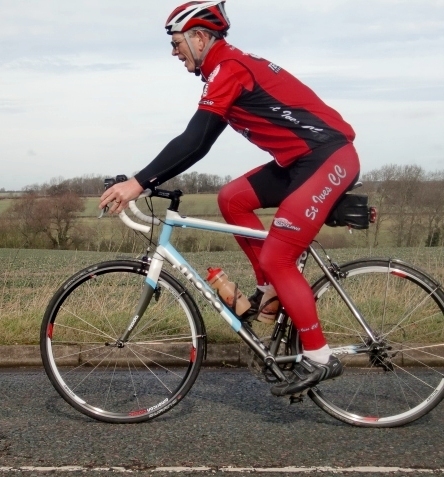 If you happen to be on the island at the same time, you may see a lot of the red kit of St Ives CC……… and before you make any comments about the leg-warmers……yes, I’ve heard them all!! But you’ve got to admit, they could become cool fashion. But I have noticed that I am the only one of the membership that dares to wear them. 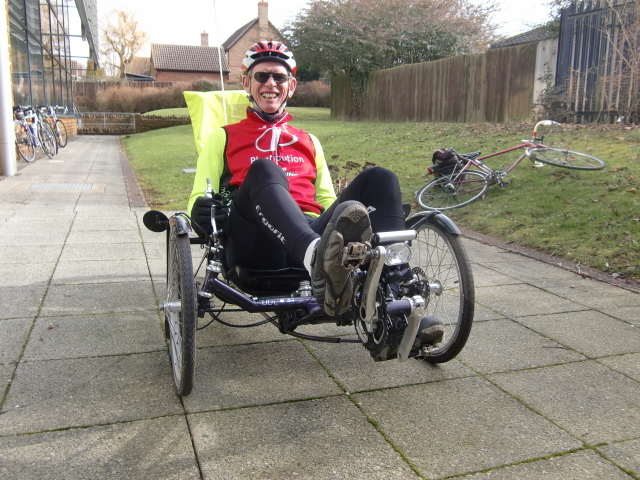 I wonder why……………. .
One day, when I get tired of the hard saddles and the semi-crouched position of a road bike, I may invest in one of these……….. this is a Trice three-wheel recumbent. It’s the closest thing to a bed-on-wheels you are likely to get! !